We watched Johnny Hawkins take over lead/front man duties with Texas-based, Nothing More. After this change, their numbers climbed and their live show exploded. 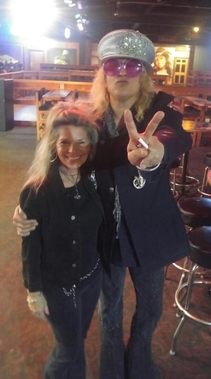 Now we hear Chip Z'Nuff, for the first time ever, take over ALL vocal responsibilities in Enuff Z'Nuff's new release DIAMOND BOY. 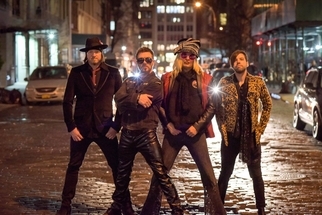 Front man and bassist Chip Z'Nuff, from the popular Chicago-based rock band, Enuff Z'Nuff has shown his fans what he can do by taking over ALL vocals on their new, 14th full-length studio album. Rock bands come and go. Band members come and go. Drugs, deaths, band member departures and changing members have haunted so many... But, there are also so many who stood firm on their music, their beliefs and their relentless desire to make more music and keep their fans happy. Chip wanted to create more music and keep their fans coming back for more. Chip is one of my favorite entertainers. I have met him in person, watched him live on stage and I have learned of his sincerity about others in general. This is a great guy. I know you are releasing DIAMOND BOY this week. Tell us more about it, what do you want your fans to know? Chip: It's rock, it's pop, it's heavy metal. A potpourri of what we stand for. It was recorded in IL on 2" tape...old elements and very tedious. It only took two months. 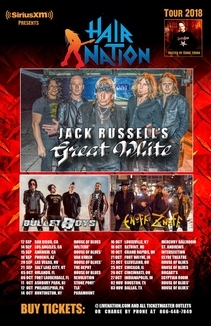 We are on Frontiers Records with Journey, Night Ranger and others. They are terrific, a strong label. I feel like we are with the "godfather"....real veterans. Chip: This is the brainchild of Eddie Trunk. Bringing back the Sunset Strip feel. This tour is reasonably priced, $20-30. Everybody will come out to do a meet & greet. JACK RUSSELL'S GREAT WHITE. They are the headliner and they should be the headliner. We are lucky to be out with them and our friends, THE BULLET BOYS. We've sold over 20M records between the three bands. Absolutely love Jack, he's a big brother, we have toured together. It starts in San Diego in September at the House of Blues, and then off to the East coast, the Midwest - 40 dates, it's exciting for all of us! What do you like most about it being 2018 instead of 1984 again? Chip: The internet, social media...makes it easier. The fans come out. But, in 1984 you could sell more records...it is more challenging now! Who would you most like to play with, dead or alive? What makes you tick Chip? You have such a style, such a look...people don't forget you. Chip: My library of songs. My 20+ albums. We owe it to our fans to stay in shape and keep our look, but at the end it's all about our music! 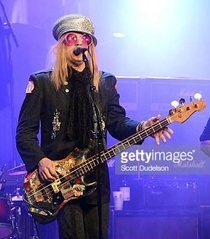 To paraphrase Chip from another interview, he described the new music this way - "Picture David Bowie and The Beatles fighting and Cheap Trick comes in to break it up!"